Darktrace have detected mass clandestine cryptomining operations, with up to 55% of all global organisations estimated to be affected, after uncovering a hidden cryptomining side business operating under the floorboards of a European bank's data center. Onfido represented London in an interview with the World Economic Forum where they defended London as the fintech capital of the world due to its strong spirit of collaboration between regulators and start-ups, rich tech talent pool, and extensive network opportunities. CensorNet have launched their new USS solution, combining patented smart user authentication with sophisticated threat protection, after being named in Gartner's first ever Magic Quadrant for Cloud Application Service Brokers. iwoca have promised to provide £100m business loans to SMEs in North England by 2020 as part of their ongoing efforts to support the Northern Powerhouse, and continue to achieve impressive traction with over 45,000 transactions completed since 2012. Second Home have announced their upcoming Clerkenwell site, due to open in Autumn, which will cater primarily to their extensive corporate client base including Ernst & Young, Volkswagen and Santander. Pass the Keys, the UK’s leading AirBnB rental management provider, discuss how property owners can take advantage of the rapidly growing short-term property rental market to maximise their rental returns. After a record number of investments in 2017 and a huge growth year for Talis’ portfolio, the team is looking to bring on board a new Associate. As Talis continues to increase its AUM and number of investments in its portfolio, the team now needs additional resource to help execute new investments and manage the portfolio. Talis Capital is an early-stage VC (Series A & B focus) that supports industry-changing and leading technology companies. Talis’ portfolio includes some of the most exciting European start-ups such as Darktrace (led Series A), Onfido (Series B & C), iwoca (sole Seed) and Pirate Studios (incubated, sole Seed & Series A) - as well as sort-after early-stage companies including Luminance and Price f/x. 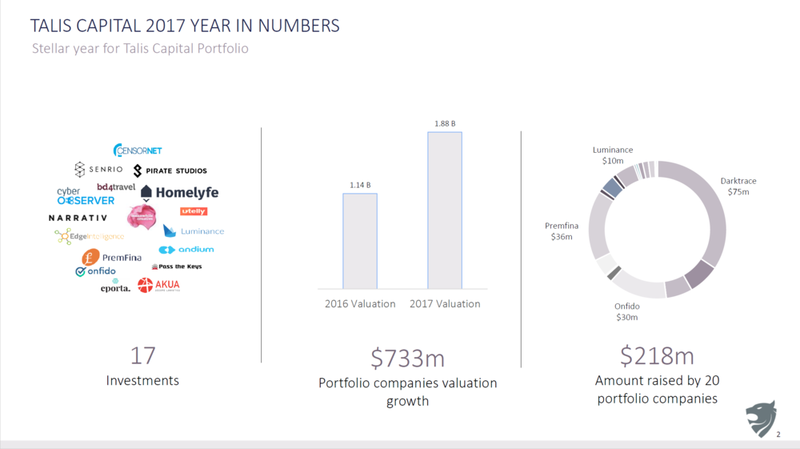 Talis closed over $400m of deals since 2009 and mostly leads 5-10 new investments per year, on top of number of follow-ons from their existing 40+ growing portfolio. The Talis team identifies and invests in both technology and tech-leveraged real businesses and has a unique perspective from its hybrid approach to private equity & venture capital. Talis only supports sustainable business models with high calibre founding teams and has a sharp focus on a handful of B2B themes (including AI leveraged cyber security, financial services, insurance-tech, prop-tech and IoT). At Talis we also incubate / build own companies. Pirate Studios, Skwire & Learning People are just some of them and the Associate will have hands on entrepreneurial experience building these or new companies. We are looking for a talented individual to join Talis where you will; gain great exposure to the European and US tech ecosystem, meet exiting new start-ups, track some of the fastest growing tech companies and work side-by-side with the Partners to find new opportunities and execute on them from origination to close. Contribute to all aspects of deal flow, from own initiative sourcing to initial evaluation of potential investments to assisting with deal execution and closing. Minimum 3 years’ experience in a relevant industry (Investment Banking, Investment Consulting, M&A/Corporate Finance, Private Equity, Venture Capital). Ability to work independently & in a start-up environment. Keen interest in technology and start-ups. You will be joining a dynamic and entrepreneurial team, friendly and non-hierarchical. Market competitive salary and bonus. Fast track carry opportunity for the right candidates. Onfido, following their success in 2017, were invited to speak again at the World Economic Forum alongside the World Bank. They have also partnered with PushDoctor, the UK's leading online doctor consultancy service, to verify 100,000 patients. Second Home have built an impressive community where start-ups collaborate with global enterprises including KPMG and Volkswagen, resulting in teams at Second Home growing 10 times faster than the UK national average. Price f(x) have had their most successful year to date after closing their largest recorded deal, doubling their customer base, expanding operations to APAC and North America, and raising $8.3 million additional funding ahead of their planned 2018 round. Darktrace have partnered with AIG to identify client vulnerabilities for their cyberinsurance analysis, and have been named on CB Insights' 2018 "AI 100" list as one of the top 100 global AI firm. Luminance have leveraged their multi-lingual platform to secure a contract with Araoz & Rueda, a leading Spanish law firm operating in more than 30 countries, and are on track to repeat their strong 2017 performance as they expand throughout America. Onfido had an impressive performance in 2017 including raising a $30m Series C round co-led by Microsoft Ventures, showcasing their ID verification solution to 10,000 attendees at Salesforce's annual conference, and achieving 550% US sales growth. Talis Capital is pleased to announce that it has co-led an additional funding round along with Credo Ventures into leading price management, optimization and CPQ SaaS provider, Price f(x). Price f(x) has now raised a total of $8.3 million on the back of its most successful year, having doubled the number of customers it serves. Price f(x) has also successfully established a market presence in the US and Asia Pacific with new offices in Chicago, IL and Brisbane, Australia. Managing Partner of Ventures at Talis Capital, Matus Maar, commented “Price f(x) has been a stand-out performer in Talis’ portfolio and we think there is a huge amount of potential within the team and technology to come. Price f(x) has demonstrated significant value to its clients through its innovative approach to price optimisation and CPQ. We can’t wait to see what the team achieves this year during a period of exciting international expansion." Established in 2011 in Germany, Price f(x) AG provides a full suite price management and CPQ SaaS solution based on a native cloud architecture, offering broad and flexible support across the entire price management lifecycle, including Price Strategy, Controlling, Setting, Optimization, and Realization. The solution is suitable for B2B and B2C as well as any industry facing the classical but also particular pricing challenges of commercial organizations of any size and geographical location. Price f(x)’s vision is to become and stay the leading SaaS pricing and CPQ solution provider through offering easy to use, fast to implement, flexible to adapt, risk-free and inexpensive, comprehensive solutions. Price f(x)’s business model is entirely based on satisfaction and loyalty of their customers, not about signing long-term commitments. Second Home have had a successful launch at Holland Park and have secured an impressive pipeline including a London Fields site due to open in 2018 alongside a 90,000 sq ft Hollywood site planned for 2019. CensorNet have been recognised as a market-leading Cybersecurity firm after being highlighted as the sole European HQ firm in Gartner's 2017 Magic Quadrant for Cloud Application Security Brokers. Darktrace have had an outstanding performance during 2017 and have now secured over 3,750 clients including two of the four largest telecommunications companies in America. Series A fundraising successfully completed at a $50m valuation. The $10m investment was led by Talis Capital, and also included Invoke Capital and Slaughter and May. Luminance technology has been deployed in hundreds of M&A transactions worldwide, in over 50 leading organisations, across 15 countries in five continents since launching in September 2016. North American headquarters in Chicago is a response to high demand from North American clients, including AM Law 100 firms. 29 November 2017, London and Chicago – Luminance, the leading artificial intelligence platform for the legal profession, has closed a $10m Series A funding round that values the company at $50 million. The investment was led by Talis Capital, and also included Invoke Capital and Slaughter and May. Luminance will use the funds to expand its operations to meet increasing global demand, including supporting its newly-established North American headquarters in Chicago. Luminance, which has been deployed in over 50 leading organisations worldwide, is a self-learning AI platform for the legal profession which accelerates and enhances contract review processes such as M&A due diligence and property lease review. The technology has been used to assist with over 200 live transactions to date. In response to strong demand Luminance has seen almost fourfold employee growth within one year. Using a unique combination of supervised and unsupervised machine learning, Luminance reads and understands vast quantities of legal documents at speeds no human can match. Moving well beyond legacy contract review software, Luminance automatically sorts and classifies contracts to uncover even subtle risks at the outset of a project. Combined with in-built, sophisticated collaboration tools, lawyers can increase the efficiency of their review by over 100% without sacrificing accuracy. U.S. Managing Director George T. Tziahanas will be responsible for meeting the needs of firms adopting Luminance’s contract-understanding technology in the region, while building out the Chicago-based team to over 10 by year end. Luminance, developed from Ph.D. research at the University of Cambridge, launched in September 2016 and has customers in 15 countries, including Slaughter and May (UK), Gilbert + Tobin (Australia), WongPartnership (Singapore) and Chapman Tripp (New Zealand). The company was recently recognised for Horizontal Innovation by the Institute of Engineering and Technology (IET) in London, and also won ‘Best AI Product in Legal’ at the inaugural CogX AI Innovation Awards. Luminance is the leading artificial intelligence platform for lawyers which uses machine learning to read and analyse contracts and other documents much like a human does, thus improving the efficiency of processes such as due diligence. Deploying some of the latest breakthroughs in pattern recognition and machine intelligence from the University of Cambridge, and trained by legal experts, Luminance understands and can highlight anomalies among large groups of documents so that lawyers can prioritise their work. The company is backed by Invoke Capital, an investment fund dedicated to unlocking the potential of European technology. George Tziahanas was appointed as U.S. Managing Director of Luminance in October 2017. In this role, he will be responsible for growing Luminance’s North American business and the Chicago hub’s staff and operations. A qualified lawyer and graduate of DePaul University, Tziahanas has held leadership positions across several global technology companies, including Intel, Autonomy and Hewlett Packard. His prior experience includes roles in software as a service (SaaS) strategy and implementation and consulting to the legal sector. Onfido have been selected as the first ID verification provider for Salesforce's Financial Services Cloud where they will enable financial institutions to easily verify and onboard new customers. Shirley Chen, Founder & CEO of Narrativ, has been named in "Forbes 30 Under 30" following her impressive background where she acted as Head of Marketing at Moda Operandi before founding Narrativ, an advertising technology start-up which now handles 4.3 trillion monthly requests. Luminance have won British Legal Technology Awards' "New IT Product of the Year" for their market-leading platform which continues to attract new clients including Chapman Tripp, New Zealand's largest full-service commercial law firm. iwoca have joined LinkedIn's Top 25 Start-ups List, alongside Uber, Deliveroo and AirBnB, and have now lent over £260m to date since their launch at the end of 2012. Luminance have partnered with TRUST, a leading Finnish law firm, and are now live across 15 countries with over 150 completed transactions since their launch in September 2016. Pass the Keys, the UK's largest AirBnB property manager, have launched in York and Glasgow ahead of their planned international expansion in 2018. Talis co-led the £2.4m seed round of Homelyfe, an insurance-tech start-up helping homeowners to manage all of their insurance requirements through a single app. Second Home expect to launch their London Fields site, designed tor working parents with plans for a fully staffed crèche, in early 2018. They are also aiming to invest over €10m to launch their second Lisbon site after achieving near-full occupancy at their original site. Onfido, a leading ID verification start-up, have raised over $60m since their launch in 2012 and are planning to help provide banking access for the two billion unbanked individuals currently excluded from the financial sector. Talis participated in PremFina's $36m fundraising round to disrupt the insurance sector alongside world-renowned co-investors including Japanese e-commerce enterprise Rakuten, investment management giant Draper Espirit, and Thomvest, the Venture Capital arm of the Thomson Reuters family. Narrativ, a female-led start-up using AI to revolutionise content advertising, have been taking action to improve the under-representation of women in the technology sector. Pirate Studios, the UK's largest music rehearsal studio provider, have developed their own live-streaming service which is gaining traction with popular independent artists. Onfido, a leading ID verification start-up, have raised a £22m Series C round co-led by Microsoft Ventures. After increasing their revenue fivefold during 2016, Onfido now cater to 1,500 clients and have been highlighted by CB Insights as a RegTech sector market leader. Pass the Keys, the UK's largest AirBnB property manager, have held their second fundraising round led by Talis Capital and are now planning to expand internationally in 2018. Reevoo have partnered with Atom Bank, a digital banking platform backed by the British Business Bank, to provide independent reviews on Atom's mortgage and fixed saver account products. Husayn Kassai, Onfido’s CEO (pictured, above) who co-founded the company with Eamon Jubbawy (now COO) and Ruhul Amin (chief architect), said Onfido is not disclosing its valuation in this round. Darktrace, a market-leading cybersecurity firm which successfully defended against the WannaCry ransom attack, has been recognised as the 3rd fastest growing technology firm in the UK after achieving c. 268% annual sales growth over the last three years. Established in 2012, iwoca is a leading FinTech firm which provides flexible credit facilities to small businesses across Europe. With over 10k small business clients since inception, iwocacontinue to grow rapidly and have been named the UK’s 21st fastest growing technology firm with c. 129% annual sales growth over the last three years. Threads Styling uses social media to connect buyers with the latest luxury clothes and fashion accessories. Following strong demand from the Middle East, Threads have been named the UK’s 32nd fastest growing technology firm with c. 102% annual sales growth over the last three years. Onfido, a start-up specialising in automated global background checks, has been identified as a potential future market leader and is anticipating to achieve c. 300% sales growth during 2017. Talis Capital is bolstering its London-based team during a major expansion period for the venture capital firm. With an impressive portfolio of industry-leading tech companies including Darktrace, Onfido and iwoca, as well as sought-after early stage companies such as Luminance, Price f(x) and Pirate Studios - Talis is capitalising on strong momentum and building out its UK team. Thomas Williams promoted to Principal: Tom has eight years of investment experience and has an excellent investment track record. He has supported investments at Talis including iwoca, Utelly, C3, Reevoo, bd4travel, Senrio, Second Home, Pirate Studios and Onfido. Prior to Talis, Tom was an asset manager at Dart Capital and worked as an execution-only broker. He has a degree from the University of Leeds, a Masters in Wealth Management and is a CFA charterholder. Matthew De Jesus promoted to Senior Associate: Matthew has four years of investment experience at Talis and is heavily involved in all of Talis' digital ventures. He has supported the Partners on investments including Darktrace, Onfido, PassTheKeys, ClickTale, Luminance, CensorNet, Narrativ, eporta, Pirate Studios and Price f(x). Matthew holds a BSc (Hons) Economics from The London School of Economics. Rachel Muzyczka promoted to Associate: Rachel joined Talis in 2016, having previously worked for 3 years in European tech M&A on over $200m of transactions. At Talis, Rachel has supported the Partners on investments including Cyber Observer, Luminance, Andium and Akua. Rachel holds an MSc from LSE, a BA from Queen Mary & Paris-Sorbonne and is currently working towards the ACA. Diogo Coelho joins as Vice President, responsible for business development and investor relations. Before Talis Capital, Diogo spent over 6-years at Capital Generation Partners in London, most recently leading on UHNW client development in London and Switzerland. While at Capital Generation Partners, Diogo was also a member of the PE & VC investments team advising on deals from less than $100k to more than $100m. Diogo is Portuguese, a Lisbon native, and holds a BSc in Civil Engineering from Instituto Superior Técnico. He holds an MBA from London Business School and is a CFA charterholder. Vasile Foca, Managing Partner and co-founder of Talis Capital commented: "The arrival of Diogo as VP and the promotions of key members of the investment team is an important step for Talis Capital as we plan to grow the number of investors and AUM of the company. This is a significant moment for Talis Capital in terms of our increasing scale and ambition and I am excited to see what we can achieve next." Matus Maar, Managing Partner Ventures and co-founder of Talis Capital commented: "We have established ourselves as leading experts in certain B2B tech areas, while delivering superior returns to our investors - this has only been possible due to hard work and dedication from everyone on our 12-member team. The promotions are well deserved, and I am excited about expanding the team further and welcome Diogo". Luminance: Market-Leading Artificial Intelligence Platform for the Legal Industry. Luminance has gained significant transaction in the legal industry since launching in 2016 - they are now live in 12 countries. Cyber Observer: Israeli cyber-security management company that provides Chief Information Security Officers and security domain managers with the ability to monitor and analyse their companies' real-time security performance. PassTheKeys: A fast-growing property tech start-up, leveraging technology to provide a unique service to Airbnb hosts and help them with hassle-free rentals. With a huge amount of European start-up activity in B2B technology - a core focus of Talis Capital - the firm's outlook is bullish on expanding and generating solid returns for investors.